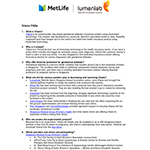 SINGAPORE--(BUSINESS WIRE)--MetLife Asia’s Singapore-based innovation center, LumenLab, has begun testing the world’s first, automated insurance solution using blockchain technology to offer pregnant women financial protection in case of gestational diabetes, without ever needing to make a claim. The experimental product, known as “Vitana,” is Singapore’s first dedicated insurance product for gestational diabetes – a condition affecting up to one in five expectant mothers in Singapore. [i] Vitana securely connects to customers’ electronic medical records via their mobile device to issue a policy within minutes. It triggers an automatic payout upon diagnosis, without the need to make a claim. “Vitana embodies MetLife’s commitment to its customers. In today’s world, people expect experiences to be simple, automated, and digital. We saw an opportunity to test how blockchain can make insurance more seamless and we’ve partnered with some of the best companies in their fields to create a blueprint to launch new parametric insurance products in the future,” said Zia Zaman, MetLife’s Chief Innovation Officer in Asia and Chief Executive Officer of LumenLab. In addition to an enhanced experience, Vitana offers customers improved data security as it performs parametric underwriting on the customer’s mobile device, meaning the insurance company doesn’t require access to the underlying medical data to confirm insurability. Vitana was built with partners: SwissRe, which helped drive product design and reinsure the risk; Cognizant, which provided the underlying technology and blockchain expertise; and Vault Dragon, an electronic medical records provider which supported on-the-ground implementation with forward-thinking doctors and clinics. Vitana was developed within the Monetary Authority of Singapore’s (MAS) regulatory sandbox, and was highlighted in MAS’ annual report as one of the key innovations to come out of the sandbox initiative. “Experimentation is crucial to invent and create the future. We are glad that the sandbox has enabled LumenLab to jumpstart an innovative experiment within safe boundaries, to understand if it could effectively address existing pain points of both the insured and insurer, before rolling it out on a broader scale,” said Sopnendu Mohanty, Chief FinTech Officer, MAS. Customers can download Vitana via the App Store to receive up to SGD 2,500 coverage for medical expenses associated with gestational diabetes. The experiment will run over a six-month period and LumenLab is working with the Singapore Medical Group Women’s Health as well as other select clinics to offer the solution to Singapore-based patients in their first 23 weeks of pregnancy (see FAQs for a full list of clinics). To learn more about Vitana, visit http://www.vitana.sg/ or read the FAQs. i Gusto, a longitudinal baby study at NUH and the KK Women’s and Children’s Hospital (KKH) (Khalik, S. 2016).